John Lindenmayer is the Executive Director of the League of Michigan Bicyclists. 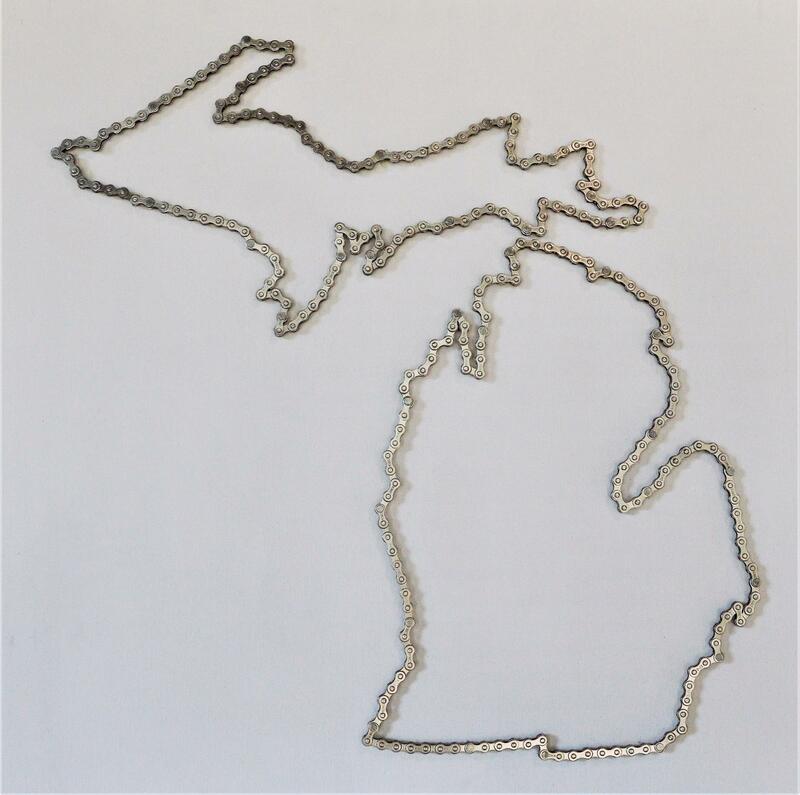 An outline of Michigan using bicycle chain links. Art by John Lindenmayer. Bicycling to work sometimes can be an obstacle course of cars. But, since this story is about making bicyclists safer, it only made sense for John Lindenmayer to ride his bike to the interview. We met on Michigan Avenue in downtown Lansing less than a block from the capitol. Cars were parked on both sides of the road and traffic was swirling in the nearby roundabout. “Bicyclists are inherently vulnerable. They don’t have air bags and seat belts and steel casings to protect them,” said Lindenmayer, the Executive Director of the League of Michigan Bicyclists. It’s his job to work to make bicycling safer. Cities have been putting in a lot more bike lanes. Road engineers are designing buffers to give bikes and cars some separation. That’s encouraged more people to commute to work on their bicycle. In Michigan about 20,000 people bike to work. “There’s more and more people who are choosing to be more environmentally conscious and choose a more sustainable mode of transportation. They’re burning calories not carbon, helping to show that uptick in bicycling in our communities,” Lindenmayer said. 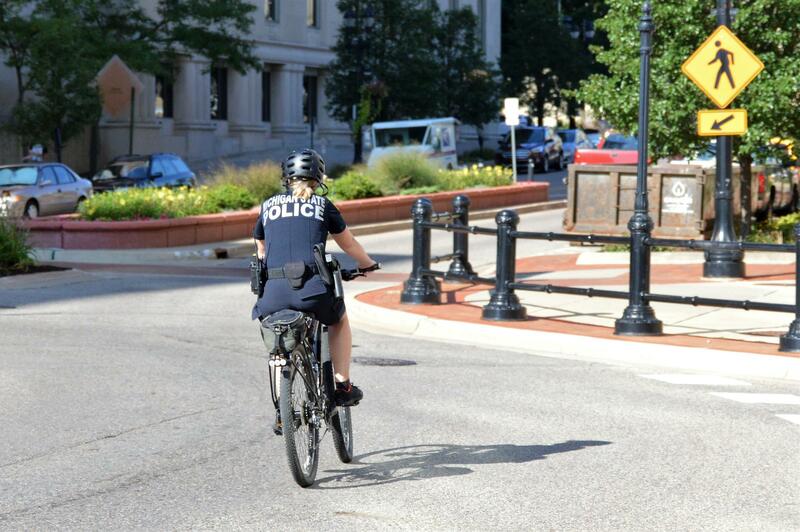 A Lansing police officer negotiating a roundabout. Now, bicyclists are asking motorists to also watch for them. “One of the things that’s really important is making sure that when they get out of their vehicle, they’re specifically looking for bicyclists," Lindenmayer said. But there is something motorists can do: the Dutch Reach. But, through interviews on the street, we found not too many people have heard of that. John Lindenmayer says the Dutch Reach is not that complicated. Cars parallel parked along Michigan Avenue in Lansing. “It’s common practice over in the Netherlands and it’s becoming more and more popular here in the United States. And, the idea is that you open your vehicle with your opposite hand,” he said. So, if you’ve parallel parked on the street and you’re in the driver’s seat, you would reach for the handle with your right hand so that your body twists and you can more easily look back to make sure there’s not a bicyclist or scooter that’s going to smack into your door when you open it. Illinois just passed a law requiring its Rules of the Road book to include the Dutch Reach. John Lindenmayer says that’s not happened in Michigan yet. There are going to be more people commuting on bicycles as cities and towns become more bike friendly. Automobile drivers and passengers have to remember to share the road whether their car is moving or parked. Survivors of last year’s deadly bike crash near Kalamazoo testified today before a state Senate committee in support of safety legislation. Paul Gobble was one of four people injured when a pickup truck plowed into a group of bike riders. Five people were killed. The driver was charged with second-degree murder. Gobble told lawmakers a “culture change” is needed between drivers and bicyclists sharing the roads.